… The impact of the EPA’s April 2010 guidelines for surface coal mining operations is represented by downward adjustments to the coal mining productivity assumptions for Central Appalachian surface mines, resulting in slightly higher estimated production costs for the region and mine type. The assumed productivity levels for Central Appalachian surface mines are roughly 15 to 20 percent lower than those that would have been used for a case without the EPA’s new permit review guidelines. The revised productivity levels are based on the assumption that large surface mining operations will decline gradually toward the productivity levels for smaller surface mines in the region as a result of the more restrictive guidelines for overburden management at large mountaintop mining operations. No adjustments were made to the productivity assumptions for other Appalachian supply regions in response to the new EPA permit review guidelines, because few if any surface mining operations in other regions employ the mountaintop removal method. There’s no mention of any of this in Hamilton’s op-ed. If he were writing a serious piece — an actual, real, thoughtful reply to the AP story — he would have explained the change in the EIA’s projections. And anyway, it’s important to remember that the 2010 EIA analysis already was projecting a drop in Central Appalachian coal production from 234 million tons in 2008 to 141 million tons in 2015 and 128 million tons in 2020. Over that time frame, the regulatory moves on mountaintop removal change the EIA’s projections for Central Appalachian from a 49 percent drop in production to a 52 percent drop in production. Does that really amount to a “war on coal”? 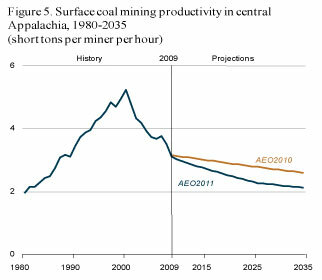 Maybe these projections of a Central Appalachian coal collapse are all wrong. Maybe another huge boom is just around the corner … but Hamilton and the coal lobby haven’t so far been able to point to a single forecast that says so. From a public policy perspective, doesn’t it make more sense for our region’s political, business and government leaders to pay attention to the projections and start planning for them? Ken, thank you for many of the points you make here. Your description of EIA’s analysis correctly points out that the new projections take into account EPA’s stronger enforcement of the Clean Water Act in regards to valley fills at Appalachian surface mines, and that previous EIA reports–which did not take the new restrictions into account–projected only a slightly less drastic decline. In fact, pretty much the only difference between the two reports is that the most recent report predicts that much of the coming decline will occur by 2015, whereas the 2010 report predicted that the decline would be more gradual, reaching its low point by around 2020. Does five years make much of a difference? The thrust of EIA’s projected decline in Central Appalachian (CAPP) coal demand–and therefore production–is the result of the waning competitiveness of CAPP coal in relation to western coal and, increasingly, natural gas. The drop in competitiveness is directly related to increasing prices relative to these other sources of fuel. CAPP coal prices–for both surface and underground mines–have nearly tripled since 2000. Additionally, the increase in price since 2000 has coincided with the onset of a sharp decline in labor productivity at all CAPP coal mines. That means that the existing, permitted mines operating in the region are producing at under capacity, suggesting that if the demand for CAPP coal were truly there, those mines would have more than sufficient capacity for meeting that demand. This does not even begin to address the rise in demand for natural gas. Since we published our Decline of Central Appalachian Coal report in January of 2010, demand for natural gas as a fuel for electricity generation has skyrocketed, taking over even more of the electricity market than had occurred in recent years. This is also having an impact on CAPP coal demand, and is due to the expansion of gas production from the Marcellus Shale basin and the continued depression of natural gas prices. The primary conclusion to be drawn here is that market forces, not tighter restrictions on valley fills, are causing the decline in demand for, and production of Central Appalachian coal. Higher Central Appalachian coal prices, resulting from sharp declines in labor productivity and the resulting increase in labor costs associated with mining thinner, more difficult to reach coal seams, are leading to a reduced ability of Central Appalachian coal to compete with other sources of coal and fuel. This is the reality. The data–rather than the opinion of myself or even CEO’s of Appalachian coal companies–suggest that if the demand were there, existing coal mines would be ready to meet it. What West Virginia’s coal miners deserve is more honesty from those who purport to represent their best interests. They deserve to be told the truth about the future of West Virginia coal. However, Mr. Hamilton and the West Virginia Coal Association seem to want to keep the miners, and the rest of West Virginia, in the dark. What West Virginia deserves is an honest, thoughtful, and rapid response to market realities, rather than mis-directed political statements aimed at supporting a declining industry. We deserve policies that support growing industries, rather than wasted energy and wasted taxpayer dollars spent to attack regulation. “The basin, which includes the coalfields of southern West Virginia, is expected to produce less and less coal each year, according to the U.S. Energy Information Administration. “Still, as demand for electricity continues to increase and drives up the price of thermal coal, it may soon become profitable to ship it to China, India and other emerging markets. But it also may change where Alpha puts its mines. Mr. Crutchfield believes that coal companies can adjust to declining production in the Appalachian basin, perhaps even by moving mining operations to other countries, but he is not a “denier” like Mr. Hamilton. Mr. Crutchfield is in the business of mining coal, not lobbying politicians, so he can’t afford to deny reality. * Various environmental interests are vigilant in their efforts to stop the surface mining of coal and the use of coal. Press releases are constantly fired out by these interests indicating victories when a coal fired power plant is shut down or a coal mining operation is shut down, and the jobs that go with them. Industry on the other hand is adamant that jobs are being lost because of EPA and these same environmental interests fighting against the permitting of these mines. * Various environmental interests are adamant in their argument that coal mining jobs have not decreased. Graphs are constantly pulled out showing this, while the industry is adamant that jobs are being lost because of EPA and these same environmental interests fighting against the permitting of these mines. * Various environmental interests are adamant in their argument that coal usage is declining and coal production is declining. Industry is adamant that coal is still a major source of energy in this nation, which is true. * Various environmental interests are adamant that coal resources are dwindling away, while industry is adamant that coal resources are available for years to come. * Various environmental interests are adamant that coal jobs in Appalachia are going away quickly because of limited coal resources, while industry is adamant that coal jobs are going away because of EPA and these environmental interests. * Various environmental interests are adamant that their government do something about the loss of jobs in Appalachia, while industry is adamant that government do something about the loss of jobs in Appalachia. Do you see the irony and in some cases downright hypocrisy in some of these views? The reason there isn’t a dialogue about the future of Appalachia is because the conversation was intentionally fractured from the start by a flawed approach to the issue. It is darn difficult for two parties to talk about a practial path forward when both parties are litigating to save themselves and their own objectives. The approach taken has forced parties to choose one side or the other – and that is an injustice for all. I have said this for years, if the environmental interests would have approached this from the perspective of how can we continue to mine coal while we concurrently identify ways to change our economy over time, we may very well have achieved some solutions. If the industry weren’t so determined to posture themselves in self-preservation we may very well have achieve some solutions by now. It is tragic that one view has chosen a path to seek the elimination of the other view. You can insert which view you want in the previous sentence. Thus, that’s why there is a war on coal, and thus we all lose. That is why, Ken, there is no discussion about the future of Appalachia. Just about everybody is forced to choose a view – you are either for us or against us. Not sure if the Daily Mail proof checks, but that’s 100 percent, not 200 percent. Regarding Mr. Hamilton’s mathematical error, even if his math were correct, his facts are not. It does not take 2 tons of western coal to provide the equivalent amount of energy as 1 ton of West Virginia coal. It actually takes 1.5 tons of western coal to equal 1 ton of West Virginia coal, which means that West Virginia coal is only 50% more efficient than western coal. However, West Virginia coal is 5 times as expensive, so for the same price as a ton of West Virginia coal, you can buy 5 tons of western coal. In terms of energy, that means you can get 3.3 times more energy per dollar by buying western coal. That does not take into account transportation costs, but the fact that coal-fired electrical utilities in Ohio and Tennessee are buying coal from the Powder River Basin suggests that even with transportation costs and the lower energy content, western coal is more competitive than West Virginia coal, even for states that border West Virginia. The main constraint is rail capacity. If more rail capacity is developed to move western coal to eastern utilities, that is precisely what would happen. I’m confused. What would motivate either side of this coal supply issue to misrepresent the truth about the coal supply? I’m particularly interested in the coal industry’s motivation. Thanks in advance. I hope it’s not the case that the coal industry is preventing diversifying the economy for their own benefit. It’d be like they were holding the people Appalachia hostage for a hefty ransom. If that’s the case, those self-centered people should be run out of town on a rail. I also don’t understand the harm in diversifying the economy. The abrupt collapse of the thriving sardine industry in Monterey CA was due to overfishing and environmental conditions. Appalachia has time to prepare, if they choose. Chris Hamilton is doing his job of representing the coal industry and he does it as well as anyone. Given the sad history of coal and poverty in WV who could be so bold to state, “As senior vice president of the West Virginia Coal Association, I assure you that this assertion is wrong”. That is Chris’s job, to promote the coal industry. If he wants to continue to be paid he can’t say coal is running out. Same for Bill Raney,who basically said in a newspaper last week that if WV wants to remain in the coal business regulations must be trashed. They are simply doing their job. It is in our best interest to sort truth from reality. I think that is what Ken tries his best to do with this blog, report the truth. Isn’t that what reporters are supposed to do? The WVU BBER report is based on the Central Appalachian coal forecast of WoodMcKenzie (formerly Hill & Associates), a leading coal industry consulting firm. Many of the Coal Association’s member companies surely purchase the WoodMcKenzie forecasts, which cost tens of thousands of dollars. How can you dispute the high-priced, highly-accurate findings of this premier industry consultant? 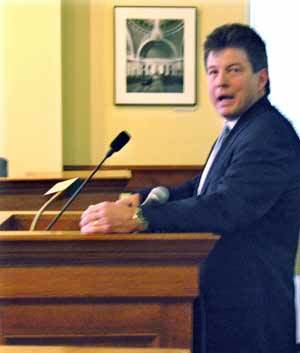 I do not think it is a radical or anti-coal position to suggest that West Virginia’s leaders should heed these preeminent forecasts, which are supported by the abundant research, analysis, and documentation over the past several decades by the former U.S. Bureau of Mines, the U.S. Geological Survey, and the U.S. Energy Information Administration. Those three sources together represent the best data we have about the economic recoverability of Central Appalachian coal, and they all forecast the same outlook. These forecasts should not be taken to foretell the “end of coal,” but they definitely do signify the beginning of an era when coal production and coal jobs will look quite different than they have in the past in southern West Virginia and eastern Kentucky. Coincidentally, the “Money & Investing” section of today’s Wall Street Journal ran a story today entitled “Coal Miners Lost on the Appalachian Trail: Signs of Collapse in Coal Sector.” The Wall Street Journal is hardly a radical anti-coal organization.